Do you want to know more about reaction calorimetry and its role in chemical safety and process development? Then you can’t miss this Syrris webinar: Introduction to Reaction Calorimetry. The webinar is free to attend and will be taking place on December 11th, with two available sessions, 8:00 GMT and one at 18:00 GMT. What is calorimetry and its role in Process Development? Why is it important to perform calorimetric studies? This is the perfect opportunity for students and experienced chemists looking to develop an understanding of reaction calorimetry, to discuss any calorimetry questions with the chemistry experts from Syrris! 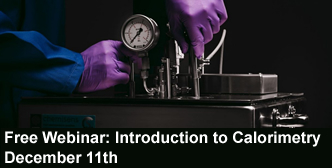 Should you like more information on this webinar or calorimetry, please contact our Sales Team.